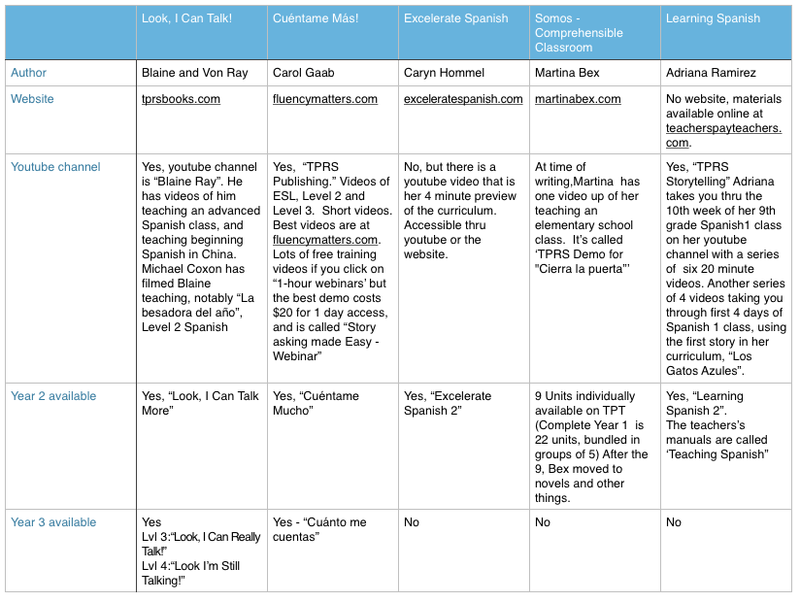 For those of us who like tables, I’ve compared 5 of the complete TPRS curricula in this Table to download. I looked at the Spanish versions of each curriculum. Remember that Ray’s curriculum is also available in French and German. Gaab’s curriculum is available in French, German, English and Japanese. Hommel’s curriculum will soon be available in Italian, and down the road, in French. Bex’ and Ramirez’ curricula are only available in Spanish. For Mandarin, refer to Terry Waltz’ website, terrywaltz.com. For Latin, start with magisterp.com for some TPRS stories, and also johnpiazza.net. Both tprsbooks.com and fluencymatters.com offers novels in many languages.